Otto Eerelman was first a pupil at the Minerva Academy, Groningen, and later attended the Antwerp Academy (1864-1865). Having begun as a painter of old Dutch interiors and genre works, Eerelman gradually established a reputation as a painter of horses. He is best known for his paintings of Queen Wilhelmina in riding habit. 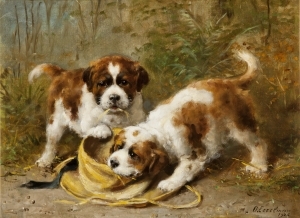 His later work from the early 1880s is almost entirely devoted to dog portraits or groups of young dogs. Museums: Rijksmuseum, Amsterdam, and Groninger Museum, Groningen among others.